How compatible are Scorpio women and Virgo men mentally, emotionally and sexually? 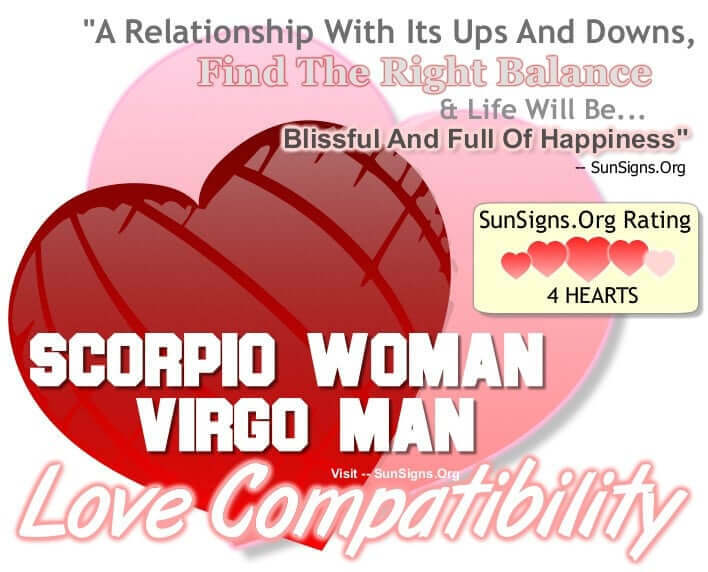 The relationship between the Scorpio woman and Virgo man has its ups and downs. The female scorpion appreciates his analytical mind while the male virgin finds her charming and confident. But she is more passionate than he is, and both zodiac signs will have to work to find a balance to make their love compatibility better. The water sign Scorpio is dark and mysterious, something that many people find captivating. The earth sign Virgo is no different, but it’s because he studies every little detail of a situation. The Virgo man often notices things that others do not, and the Scorpio woman is a very puzzling individual to him. Although the Virgo male stands back in observation, she will notice him studying her and be intrigued by his facial expression. While most men give away what they’re thinking, Virgo men just come off as curious. But once the Scorpio female strikes up a conversation with him, she will understand his methodical nature. The Virgo, in turn, will use that time to try and figure out who she is and what she wants out of life. She won’t give him all the answers, for she always keeps a little for herself, but she will tease him enough to keep him coming back for more. And this will be the case with a lot of things in the Scorpio woman Virgo man relationship. Both the Scorpio woman and the Virgo man are often successful in their careers, and they’re both cautious with their finances. The Scorpio woman is a born leader while he is ambitious and determined, and this creates a strong match. Their home life will be very comfortable, and they can trust each to make rational decisions. The Virgo male is grounded and practical in his approach, giving her a solid foundation on which to build their physical relationship. And it will be very physical, as he pays attention to every detail in her approach. She is passionate and intense, and he can match that intensity when he wants to. The Scorpio woman will have to reassure him that it’s okay to try new things, and he will have to learn some of her more primal techniques. But even though his symbol is the virgin, he is usually a very skilled lover and she will enjoy taking their love to new heights. Although the Scorpio woman is ready to take things into the bedroom, she will have to wait for the Virgo man to make up his mind first. And that won’t be easy, for she’s used to taking the initiative and leading men where she knows they want to go. But her Virgo partner is more thoughtful, more conscientious of how and why things are happening to just rush into something. This may drive her crazy at first, but once he obliges he offers her a consistent sexual mate. Sometimes she may be overbearing and this prevents him from being able to execute his tried and true style. The only snag in the Scorpio and Virgo relationship is his desire for perfection. Virgo men are so structured and disciplined that they may come across as cold or distant, and this will make their Scorpio partner suspicious. Scorpio women can be very jealous, and if the Virgo isn’t forthcoming with his feelings they may think something is wrong. And if she gets angry enough, he will feel the lash of her stinger. Of course, the only way he knows how to argue is with logic. Scorpio is a fixed water sign whereas Virgo is a mutable earth sign, the Scorpio woman man compatibility gets a FOUR Hearts rating. The Virgo man will have to learn to connect with her emotionally and the Scorpio woman will have to realize she can’t always read his thoughts. But if the Scorpio Virgo couple can reach this common ground, they will be together for life.